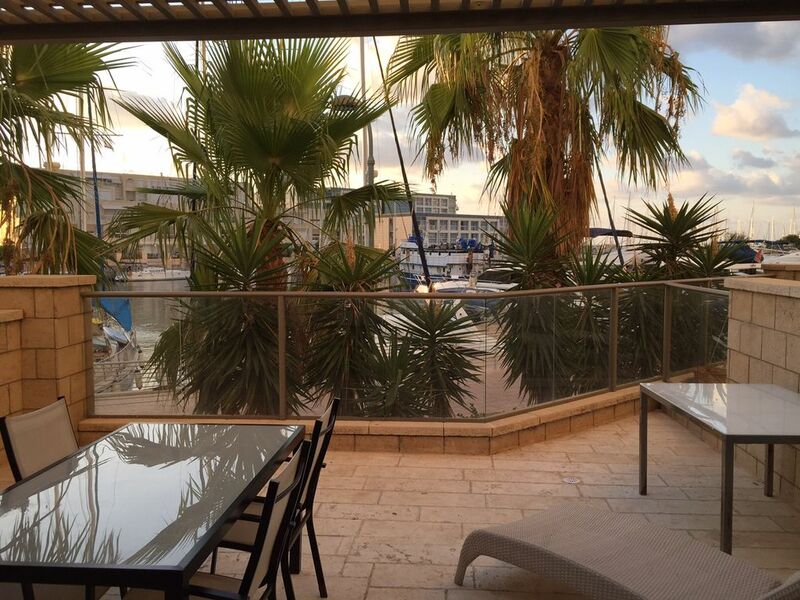 Luxury 2BR Herzliya Marina with Huge Porch! This is a beautiful 2 bedroom 2 bathroom apartment in the Herzliya Marina (Laguna Building) about 15 minutes north of downtown Tel Aviv. It is a ground floor unit with a large outdoor space that looks right onto the marina boardwalk. The complex has a gym/pool/24 hr doorman and the beach is a 1 minute walk! There is indoor parking for 1 car and there is a washer/dryer in the unit. Shops/food/mall all in walking distance. Great beach atmosphere. Pricing subject to change. Physician working in New York with frequent visits to Israel. Very special place due to location and proximity to beach and sailing community. Walking distance to mall and supermarket. Parking in the area is difficult but we have 2 dedicated indoor parking spaces! Beach is 150 meters from entrance to apartment complex. We stayed for two weeks in Feb. 2018. If you have a family and would like to stay in a place the feels like a vacation house - this property is just perfect! The apartment is big enough to fit a family with 3 kids. It’s condition is good and you will find everything you need inside. Sitting in the large balcony right next to the beautiful Marina is one of this property’s main highlights. Parking spot is very convenient, and the indoor pool is great. Don’t think you can find a better place for your stay, unless you are willing to pay x3 more. 1. The host is very reasonable and easy to communicate with. He is very easy to get in contact with, and goes out of his way to be as accommodating as possible. 2. The apartment building is located in a great area, about a 2 minute walk to the sea. Also, the building is right on the marina, which is a 5 minute walk to the supermarket, restaurants, and a mall. 3. The apartment comes with a very convenient underground garage parking space. 4. The WiFi in the apartment is very fast. 5. The building has great amenities and a convenient and accommodating staff. 6. The apartment has a large terrace that overlooks the marina, it is a nice view. 1. The apartment itself seems to not be adequately maintained. There are light bulbs out (about 1/3 of the bulbs throughout the apartment), holes in the wall from previous decorative hangings (medium-sized holes, but there are not very many of them). 2. The apartment lacks some basic amenities and supplies, such as: hand soaps, laundry detergent, toilet tissue, ice cube trays, garbage bags, and other misc. day-to-day home supply items. 3. The outdoor furniture is in disrepair. 2/4 chairs are unusable due to rusting and broken chair frames. The lounge chair is also unusable. The straw-netting of the chair is damaged and cannot be used. 4. The apartment lacked some basic instructions on how to use the air conditioner, washing machine, drier, oven, television, and cable. 5. The dishes, towels, silverware, utensils, cups, and other kitchen supplies were mis-matched, and seemed like “hand-me-downs”. The coffee mugs had chips in them, some plates had chips, and the pots and pans seemed old and were uninviting to use. Overall, our experience in the apartment was not a bad one. The host is great, speaks English very well, and is very reasonable and easy to work with. Also, the host was very fair about our security deposit, utility fees, rental fees, etc. The apartment building is wonderful, and located in a great area. If the apartment’s amenities were in better condition, and a little more attention was paid to the details, this place would be perfect. Regardless, however, we still enjoyed our stay in the apartment. Thank you for the feedback. We strive for 100% satisfaction and hope you will give us a try again! If you lie to fell you are vacationing yet have the comfort of home - this apartment is the perfect solution for you. It is perfectly located by all aspects, it has both the homey advantage and vacation facilities such as a swimming pool, gym and of course the marina itself where the sunrise is particularly beautiful. The owner is very responsive, and the building feels very safe. We enjoyed each and every minute of it. One huge advantage for those who like their privacy: if you don't like people getting into your room daily while you are away, than this is so much better! No one walks in, because while you are there - it is your home! In terms of location: easy access in and out to the main highway without the noise of a highway. Perfect! Thanks for staying with us! Glad you enjoyed your visit. Thank you for hosting us in your apartment. The apartment is clean, modern and spacious. The balcony is a bonus room. We ate every meal on the balcony which overlooks yachts and sailboats in the marina. It is serene and relaxing even to just to have a coffee or glass of wine on the balcony, you feel like you are on a private cruise. The building is modern with full time security. The swimming pool overlooks the beach at one end, and the marina at the other. There is a synagogue and a gym in the complex. Did I mention that the front door is steps to the beach, and the walkway behind the building winds along the marina to outdoor terrace restaurants and cafes, as well as a 2-story indoor shopping mall with fashion boutiques as well as a supermarket and pharmacy. Adjacent to the mall is the Ritz Carlton hotel, which has a great rooftop restaurant for special occasions. Being neighbors to the Ritz and the Herrods hotel speaks for itself about the prime location of this luxury apartment. If it's available to book, consider yourself lucky - I really hope it's available anytime I want to return! We just stayed for 1 week in this apartment with our 3 kids (6,8 and 10) and it was a really wonderful experience. The apartment is on the ground floor level so my wife was a bit worried about privacy, but we were pleasantly surprised that ground level is half floor elevated and the balcony creates excellent privacy. The owner Elan was very responsive from beginning to end, when we had questions, and this was great. The apartment is beautiful, and the location rocks!! walking distance to restaurants, supermarket and beautiful surfer's beach, with a little truck converted into a coffee/breakfast spot right on the water. It was for us 1 week of bliss, I will definitely recommend this spot and will be back. The only thing need to know, that there is normally hot water in the shower (there are 2 showers in the apartment), on occasion there wasn't so needed to turn the hot water heater for 10-20 min ahead of time, the hot water heater button does not hold so easy, so need to hold it with a piece of paper or press hard enough until it sticks. It is absolutely a non issue, but thought to share with the next renter. Thanks for the kind review! We fixed the hot water heater switch! Additional charge for power/electric usage. Prices subject to change.